Hi, I am interested in your 1998 Chevrolet Camaro (stock #5112-CHA) listed on Autotrader for $17,995. I'd like to get more information about this vehicle and confirm its availability. 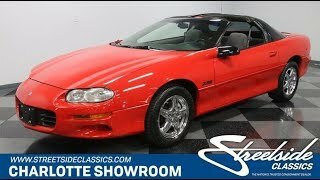 Sleek, stock, powerful, and affordable, this 1998 Chevrolet Camaro Z/28 is the loaded, low-mileage T-top coupe thats also part of a new class of classics. This is a great year to collect a Camaro. It was the final evolution of the 4th gen with an upgraded design and a more powerful V8 under the hood. So its great to find one as well-preserved as this example. The Flame Red paint has the look an aggressive sports car needs, and theres a glossy finish that shows this one has been treated with care. Its the kind of red that loves the sunshine, because the luster really shows off details, like the hood curves created by the updated headlights, sleek profile, and the well-integrated rear bumper. And of course, these wont look so good today without excellent panel fit. This is a modern classic, and so it makes a statement without adding body chrome. But like any good American, theres still brightwork. Its just now reserved for the 16-inch polished factory alloys. Inside is a loaded and preserved interior. The high-back bucket seats are finished in a comfortable cloth, so youll never hesitate to hop in on a hot day, even when the T-tops are out. Other great features include power windows, power locks, keyless entry, power drivers seat, cup holder center console, tilt wheel, air conditioning, and a powerful Monsoon AM/FM/CD factory stereo. Owning a modem classic also means modern safety, including dual airbags and anti-lock brakes. The 5.7-liter LS1 V8 was an upgrade that made these an instant classic, and this is the original powerplant under the hood. With 305 horsepower right out of the box, this a fuel-injected speed machine. In total, this one was built to offer the right balance of performance and comfort. It starts with the four-speed automatic transmission. This is quick with a kick-down to release the power, and its also happy to cruise on the highway in overdrive. Plus, cruise control and power steering make the long haul easy. And the four-wheel disc brakes and sway bars front & rear are great to open up the backroads. The moment you drive this one, you can feel the solid feeling that tells you this has been given the right respect all its life. So if youre looking for a true classic that delivers true performance all without breaking the bank call today!